Who else keeps writing 2018 in their dates? Same. 😅 Well, whether we’re ready or not, 2019 is here, but with the new year comes new opportunities. Read this blog for advice for how to make the most of this year by starting off on a good note. New Year, New You. Do you have a New Year’s resolution to be healthier? Don’t worry, you’re not alone. There are a few ways we can help you stick to your resolution. This year those resolutions are going to stick. Water, water and more water. A part of any healthy lifestyle is a lot of water, and we can help! Water fountains with water bottle stations are located throughout the Union. Simply take your water bottle to one of these stations and fill it up with cold, filtered water for free. These are great whether you’re passing through the building on your way to class, grabbing lunch with friends or studying for class (it’s never too early, right?). Walking is always great for your health. Next time you have some extra time during the day (like those annoyingly long breaks between class when there’s too much time to sit in a classroom building but there’s not enough to go home), consider walking one of the two Student Union walking trails. Part of the Cowboy Walking Trails program, the Student Union has two trails: the .75-mile orange route and the .35-mile silver trail. Both trails are indoor, taking you through different floors of the building. Check them out here. Maybe you have a resolution to be less stressed and give yourself more “me time.” If that’s the case, visit the Reboot Center in room 320W on the third floor of the building. The Reboot Center offers many services, including quiet space for calming the mind and body and stress-reducing video games. There is no cost, and no appointment is needed. See more information here. Sometimes all you need is to interact with some cute dogs. Ruff Ruff Reboot happens every Tuesday and Thursday from noon to 1 p.m. in the Reboot Center. Pete’s Pet Posse will be at the Reboot Center during these times for you to visit. More information can be found here. You might also consider relaxing in different areas of the building to help clear your mind. The first floor can sometimes be busy and loud, but the fourth floor is almost always quiet, and there’s plenty of comfy seating! The Cowboy Underground in the basement is also usually quiet and relaxing. When the weather warms up, visit the West Porch, which overlooks the Formal Gardens. This is a great place to spend time when warmer spring weather comes. The University Store can help you make the most of the year by starting off on the right foot. Whether you’re trying to maintain resolutions or you want to be prepared to have a successful semester, we’re here to help. This cold weather can put us in a bad mood from time to time, but comfortable, cozy, warm clothes can always help. 😊 Our OSU Basics line provides simple but comfortable OSU spirit apparel, like the sweatshirts you see below. See more here. New year, new workout routine. OrangeTech inside the University Store has an assortment of wearable tech items, including FitBits and Apple Watches. If you already have one of these, visit OrangeTech to shop for accessories. Own those workouts with a new watchband or case. If you need some workout clothes, we’ve got what you need. These clothes are great for torching those calories in America’s Brightest Orange! 💧 See more here. In order to have a successful semester, you’ll want to be as prepared as possible. If you haven’t already, order your textbooks online here, or stop by the store. The University Store offers much more than textbooks, though. If you’re looking for a new planner, visit the supplies section near the back of the store. You can also get the school essentials, like notebooks, pens, scantrons and more. This year, we want you to live your best life. Not only do we offer options to fit your lifestyle, but we also want you to take advantage of the convenient locations across campus. More salad, less sugar this year. This semester, kick junk food cravings to the curb with the Choose Orange program. The Choose Orange icon, featured below, makes it easier to identify healthier options on campus. Based on U.S. Dietary Guidelines, Choose Orange items include lean meats and other proteins, vegetables with limited salt and sauces, fruits and 100% fruit juices, low-fat dairy products and whole grains. Look for the icon at our dining locations across campus. Need dinner plans for tonight? Try the Choose Orange meal at Country Barbeque! This meal includes smoked turkey, a baked sweet potato, side salad, whole-wheat dinner roll and 1% milk. 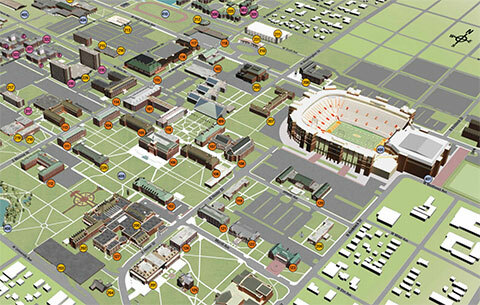 With more than 30 dining locations on campus, you’re never far from food. As you establish your routine for this semester, consider trying some new places. If you have classes in a new building, it might have a dining concept inside of it. Take a look at our locations here. A new year offers opportunity. It might be the opportunity to continue healthy lifestyle choices you made last year, or maybe the opportunity to begin new healthy habits. No matter what you’re trying to achieve this year, let us help you. Good luck, and Go Pokes!